Oh what?” shouts the band director. The marching band is taking the field again at Ohio Wesleyan and is ready to make some noise. After just five weeks of practice, the 31 men and women who make up the Marching Bishops performed a rousing halftime show during OWU’s season opener against Wooster on Sept. 15. The last time an OWU marching band strutted on the grass at Selby Stadium, John F. Kennedy was president, and it was 1961. For the 1 p.m. game against Wooster, on a sunny day with temperatures pushing into the upper 80s, close to half of the home-side crowd appears to be there for the band (no offense to the Battling Bishops, who go on to win 9-7). For the halftime show, the fans cheer, clap, and listen attentively, then swap positive critiques. But the band members are there to support the football team. Before the game, seated in the stands, they chant and cheer and crank up the crowd with music and general zaniness. The “William Tell Overture” is involved. Members alternate heckling opposition players with performing a selection of their “stand songs” like “Crazy Train” and stanzas from “Tell” to punctuate game action and timeouts. 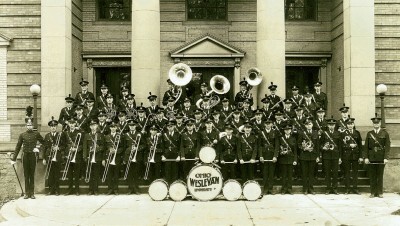 OWU’s marching band in the 1930s. As Wooster lines up to kick off, a drumroll emanates from the percussion section. All the band members join in with an anticipatory “Ohhhhhh …” as the kicker approaches the ball, and a loud “WOOOO!” when the ball is struck. It is music to the crowd’s ears. 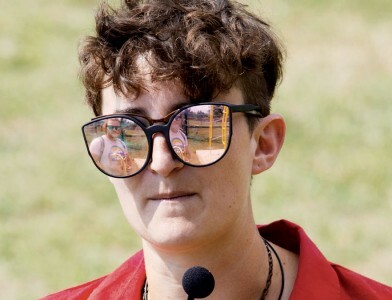 The fanfare is the result of more than a year of planning and recruitment by Mary Kate McNally, who leads the band in mirrored sunglasses and with the personal passion of 1,000 pep bands. 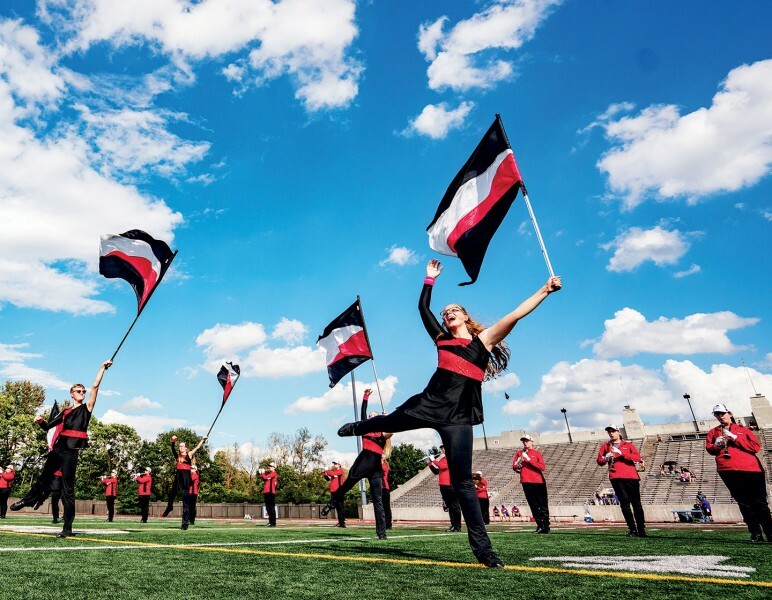 Coming on as Ohio Wesleyan’s director of marching and spirit bands in August 2017, she’s spent a year recruiting band members and prepping music, marching routines, and rehearsal plans. More than this, she’s working to reintegrate marching band into the campus and community culture, with appearances at Main Street Delaware’s “First Friday” celebration, the tailgate at Homecoming & Family Weekend, and a surprise celebration of President Rock Jones’ 10th anniversary at OWU. 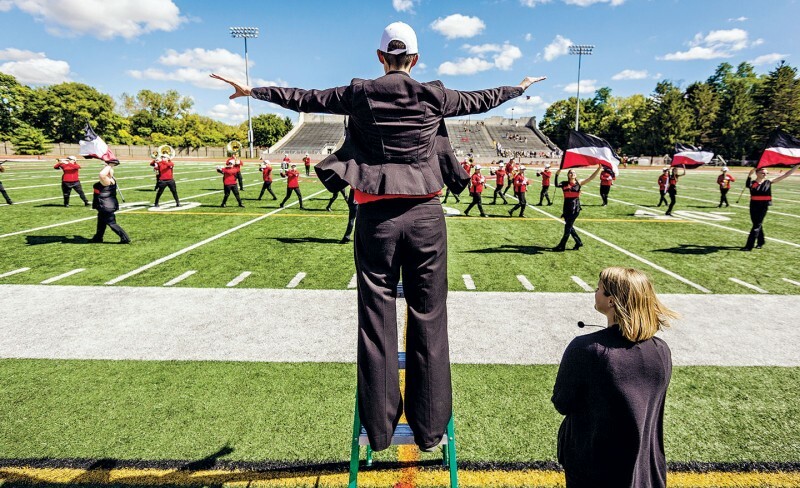 Most of the first year of her job was devoted to recruiting, visiting high schools, and attending music-educator association events to spread the word that marching band was returning to OWU. She also worked with the Office of Admission to identify incoming students with an interest, resulting in 24 first-year students in the band. Thirty-one is not a large number for a marching band. But it’s a long way from zero. McNally has worked with much smaller ensembles. The native of Monument, Colo., received her undergraduate degree in music education from Henderson State University in Arkansas in 2012. She moved back to Colorado to teach in public schools for three years before coming to Ohio to earn her master’s in music conducting at Kent State in 2017. Teaching in Colorado, “I was in a very rural town in a very rural district,” she says. 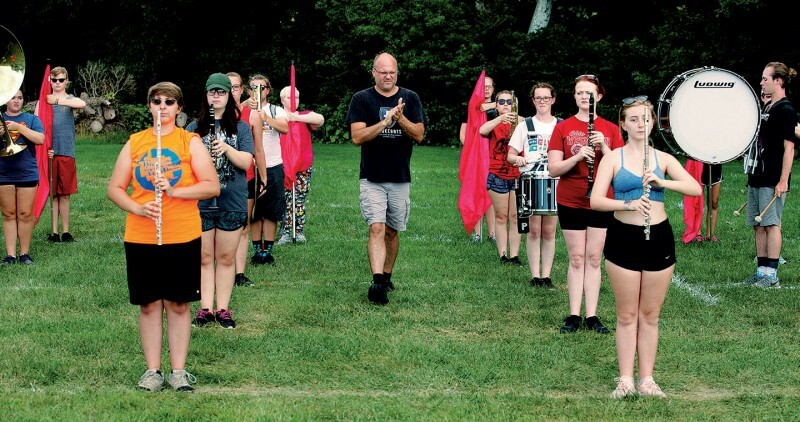 The Marching Bishops practice three evenings a week, and performances are focused on home football games with appearances at other key events. The band was featured throughout Homecoming & Family Weekend and will march in the Delaware Christmas Parade in December. 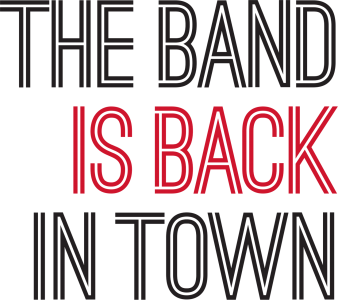 After football season, the ensemble will switch gears to become the Bishop Basketball Band, a winter-season pep band that will rehearse just a couple of times a week and perform at home basketball games. Students are free to participate in one band or both. Aleea Ratcliff ’22, a first-year saxophone player from Fairborn, Ohio, near Dayton, is double-majoring in zoology and environmental studies, with an English minor. She was a little worried the football team would be mad at the band, but she says that didn’t happen. “We were just trying to have fun and get the team motivated. At most (high) schools, the relationship between the band and the team is not that great – but not here. Everyone is nice and we’re all excited,” Ratcliff says. Maddie Marusek ’22 is a first-year clarinet player from Gahanna, Ohio, where she marched in her high school’s 200-member band. But she says marching in OWU’s modest band was a great early introduction to the tightknit community she’s finding at Ohio Wesleyan. “I really like everyone. I feel like we were able to bond really quickly in band camp, and we all knew someone when school started,” Marusek says. 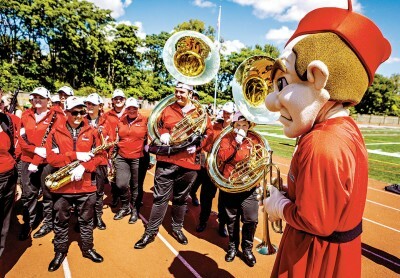 To view a video of the new Marching Bishops performing at the season opener – and the 1951 band at Homecoming, visit owu.edu/marchingband. Joe Meyer is a freelance writer from Westerville, Ohio.